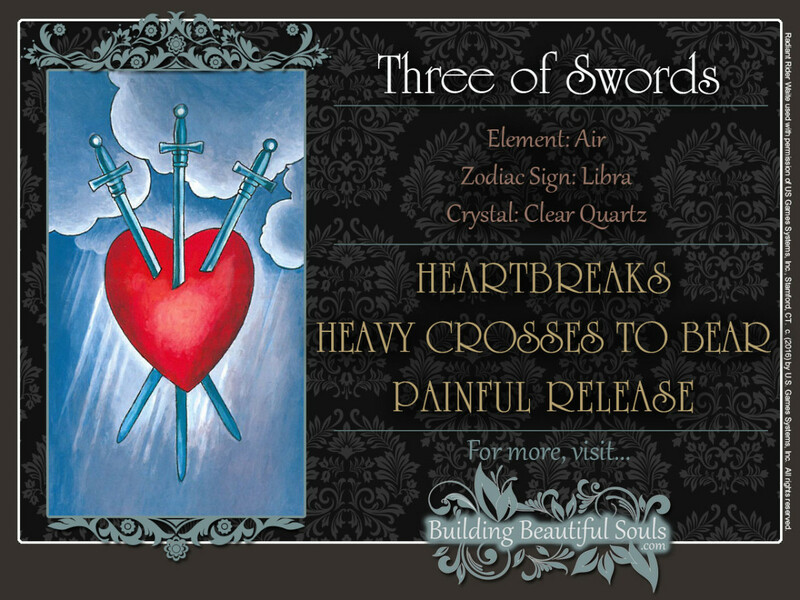 The symbolism in The Three of Swords tarot card, showing a heart pierced by three swords and suspended in a stormy sky, is more complex than it looks. 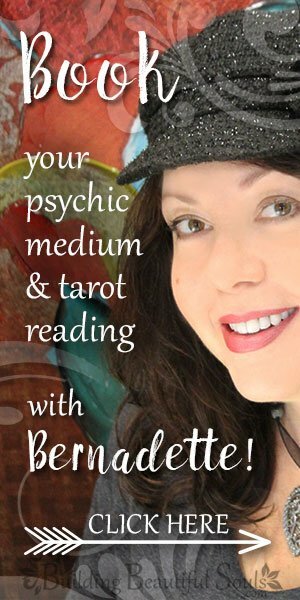 When the Three of Swords card presents itself in a reading, it is asking you to dig deeper – perhaps to the depths of your soul. The Three of Swords tarot teaches that acknowledging your pain is an important part of your healing process. If you can’t feel pain, you won’t know you’re sick. No, pain does not “purify the soul.” It doesn’t make you wiser or nobler but it is a signal that “something” is very wrong because our birthright is to live in an abundant universe of joy. All too often we ignore problems and doing so won’t make the issues go away. It only makes situations worse. By facing our fears (the root of all negativity) we can get on the path to healing. The Three of Swords’ Kabbalistic title is Lord of Sorrow. In most tarot readings, the Three of Swords card is the sorrow human beings experience in everyday life. In this case, it points to that “cry like a baby” watershed that makes you feel so much better afterwards. Saturn has stormed through Libra like a bull in a China shop, and there goes that delicate balance you’ve been trying to hold onto in the Two of Swords! But if you’re honest with yourself, it wasn’t meant to last. There is a silver lining here. Note, that the three swords are pointing down. This means that they’re at rest. Yes, the damage is done. But there’s no more to come. These tears are sacred. They are the tears of healing. Though The Three of Swords tarot is one of the most difficult cards in the deck, take a close look at the Swords. They resemble crosses. In this, the Three of Swords tarot card can suggest that those who “bear their crosses” bravely, become more spiritually awakened – more “Christ-like”. As we become more conscious, our words, actions and deeds have a kinder impact on this world. Despite the unsettling imagery in the Three of Swords card, there is no disaster in your near future. However, it does suggest an immense emotional outpouring. Tears are likely to flow. But you know that this cry has been long overdue. The strange thing is that the longer and louder you cry, the better you feel. Psychologists call this experience catharsis: an intense, emotional release. In many cultures, crying is part of a spiritual awakening. It’s your body reminding you that you’re still alive. It’s actually pretty much the first thing you do right after you take that first breath of air in this world. Suddenly, you’re no longer in the comfort and safety of the womb. A zillion new impressions force you to reevaluate everything you’ve known and felt so far. In this sense, the Three of Swords is also a card of initiation. Applied to everyday life, the Three of Swords tarot card tells you that your emotions must now face cold, hard, rational facts. For example, you may find that a proposal you’ve submitted is being picked apart with some pointed questions – literally! If you’ve done your homework, you can be sure that you’ll ride this storm out. But whatever the outcome may be, the Three of Swords will teach you the discipline required to weather the next challenge. Roll with the punches. Learn what you can. But no matter what, don’t allow yourself to be decimated by what’s happening now. You’re so much stronger than you think! The Three of Swords also points out that the worst part of a crisis is over. The swords are pointing down. They are at rest, and they won’t rise again. Yes, you’re hurting now. But the important thing is that you’re alive. As far as your spiritual path is concerned, in the Three of Swords tarot card you’re now being confronted with a paradox: How can a good God allow bad things to happen in this world? Your answer to this question will determine how the rest of your spiritual development unfolds. When reversed, the Three of Swords tarot points out that you’re not dealing well with an emotional loss or personal setback. Maybe you’ve been bottling up your pain for too long. On the other hand, this card also points out that your actions are often excessive when emotions are running high. Both are unhealthy ways of managing your emotional household. If you keep pushing down your hurts, they won’t go away. They’ll fester and grow while you do nothing about them. In the end, they can consume you. How are you handling strong feelings – good ones or negative ones? The reversed Three of Swords card suggests that your emotional equilibrium is easily upset. Good news may give you a false sense of invincibility. For example, if you’ve just paid off your credit card debt, you may decide to go on a reckless spending spree, maxing out your card in just a few weeks. Bad news may send you flying into a blind rage, and that’s dangerous for those around you – and yourself. You need to be especially careful when confronting those who have wronged you. Justice and revenge are not the same thing. Justice often requires that you compromise, but it also clears the path to closure. Revenge only repays one wrong with a greater wrong. And where does that put you karmically? Kabbalistically, threes are associated with Jupiter, who is reminding you of your higher purpose. In traditional Numerology, 3 corresponds to Saturn whose influence is indeed destructive. However, Saturn is also known as the “Great Initiator.” Combined, these energies suggest that there may be some method to this madness.